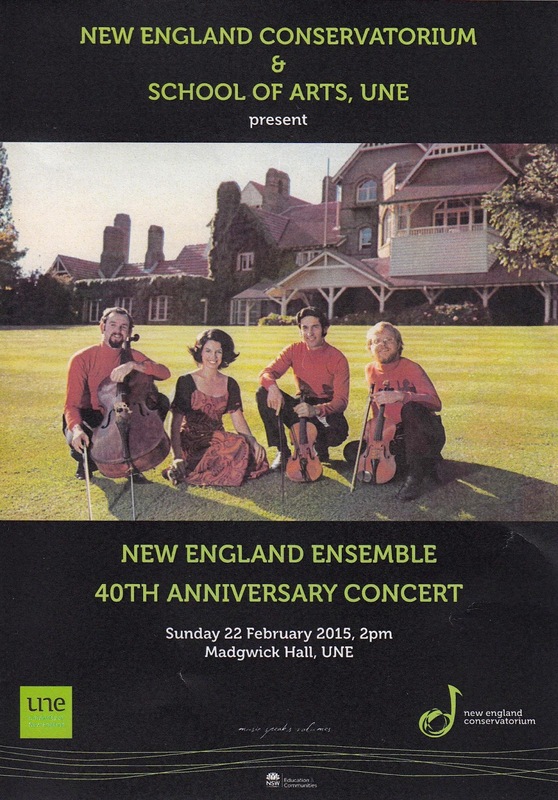 This afternoon I had the pleasure of attending, in the Madgwick Hall at the University of New England, a concert given by the members of the former New England Ensemble to mark the fortieth anniversary of the first concert they gave on campus in 1975. The Ensemble (Andrew Lorenz, violin; Robert Harris, viola; Janis Laurs, cello; and Wendy Lorenz, piano) was ensemble-in-residence in the University's Music Department from 1975-82 and by all accounts made a lasting contribution to the musical life of the city and the region. In returning from studies abroad to take up their appointments they became the first full time professional ensemble based outside a capital city. They achieved national and international recognition. Beethoven's Piano Quartet in E-flat Major Opus 16 was their first commercial recording, with the Cherry Pie label in Sydney. It went to three pressings in the first twelve months of its release. Peter Sculthorpe's Landscape II was commissioned by Musica Viva for the New England Ensemble. Dvorak's Piano Quartet in E-flat Major Opus 87 was the first work they performed, in the same hall, almost forty years ago to the day. It was a great occasion, well attended by an enthusiastic audience, and it is a great pity that it had to be a one-off.